1 Bioprocess and Molecular Engineering Research Unit (BPMERU), Department of Biotechnology Engineering, Faculty of Engineering, International Islamic University Malaysia (IIUM), Malaysia. 2 Ahmad Ibrahim Faculty of Laws, International Islamic University Malaysia(IIUM), Malaysia. 3 Government Medical College and SMHS Hospital, Srinagar, J&K, India. 4 International Institute for Halal Research and Training (INHART) Faculty of Engineering, International Islamic University Malaysia (IIUM), Malaysia. Copyright: © 2017 Shajrat Mir and Parveen Jamal et al. This is an open-access article distributed under the terms of the Creative Commons Attribution License, which permits unrestricted use, distribution, and reproduction in any medium, provided the original author and source are credited. Recieved Date: September 26, 2017; Accepted Date: October 10, 2017; Published Date: October 27, 2017. Biosurfactants are surface active agents produced naturally by a wide variety of microorganisms, which include different strains of bacteria, fungi and yeast. Biosurfactants, also known as microbial surfactants, are amphiphilic compounds. It is the amphiphilic nature of biosurfactants that makes them excellent foaming, emulsifying and dispersing agents. The .0surfactants or biosurfactants increase the surface area of the water-insoluble hydrophobic entities. They are surpassing their chemical counterparts. This can be attributed to diversity, high biodegradability, less toxicity, greater stability and ecological acceptance of biosurfactants in comparison with the chemically prepared surfactants. However, currently, production of biosurfactants is a very expensive process mainly because of the costly synthetic media required by the microorganisms to survive and grow. Therefore, much stress is being put on augmenting researching on cheap or cost free and nutrient rich renewable wastes to be used as substrates for various microbes to grow and produce biosurfactants. Research for new strains with high productivity is a challenge for the widespread application of microbial surfactants. This review focuses on the extensive evaluation of biosurfactants and their application on commercial scale. Surfactants are among most versatile products of the chemical industry. Surfactant is an abridgment of the term surface active chemical compound(s). A surfactant is a substance, when present in a system, having property of adsorbing onto the surface or interface of the system and alters to a great extent the interfacial energy of those surfaces. The term interface denotes the boundary between any two immiscible phases, and term surface denotes an interface where one phase is gas, usually air. The interfacial energy is minimum amount of the work required to create that interface. In order to determine interfacial tension between two phases, interfacial energy per unit area is to be measured. It is the minimum amount of work required to create unit area of interface or to expand it by unit area. The surface tension is also a measure of difference in nature of two phases meeting at the surface. The interfacial energy per unit area required to create the additional amount of that interface is product of a interfacial tension and increase in area of interface. A surfactant is, therefore, a substance which at low concentration adsorbs at some or all of interface in the system and significantly changes the amount of work required to expand those interfaces (Rosen and Kunjappu, 2012). Surfactants are characteristically organic compounds containing both hydrophobic groups which form the integral part of tails and the heads are composed of hydrophilic groups. Therefore, a surfactant molecule contains both a water insoluble (and oil soluble component) and a water soluble component. They are amphiphilic surface active agents possessing both hydrophilic and hydrophobic moieties that reduce surface and interfacial tensions by accumulating at the interface between two immiscible fluids like oil andwater, signifying that surfactants moreover assist the solubility of polar compounds in organic solvents. They are of synthetic or biological origin. Due to their interesting properties such as lower toxicity, higher degree of biodegradability, higher foaming capacity and optimal activity at extreme conditions of temperatures, pH levels and salinity, these have been increasingly attracting the attention of the scientific and industrial communities. Increasing public awareness of environmental pollution influences the search and development of technologies that help in clean-up of organic and inorganic contaminants such as hydrocarbons and metals. An alternative and ecofriendly method of remediation technology of environments contaminated with these pollutants is the use of biosurfactants and biosurfactant-producing microorganisms. The diversity of biosurfactants makes them an attractive group of compounds for potential use in a wide variety of industrial and biotechnological applications (Pacwa-Płociniczak et al., 2011). Microorganisms produce a wide range of surfactants, generally called biosurfactants. Microbial surfactants are surface entities that are generally produced by bacteria, yeast and fungi and possess very different chemical structures and physical properties (Amaral et al., 2010). Microbial surface-active compounds are a group of structurally diverse molecules produced by different microorganisms and are mainly classified by their chemical structure and their microbial origin. 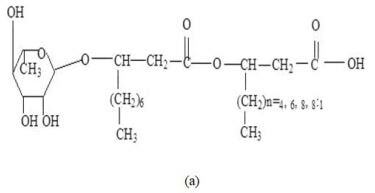 They are made up of a hydrophilic moiety, comprising an acid, peptide cations, or anions, mono-, di- or polysaccharides and a hydrophobic moiety of unsaturated or saturated hydrocarbon chains or fatty acids. The hydrophilic (polar) part of the biosurfactants is commonly referred to as 'head' and the hydrophobic part (non-polar) is known as 'tail' (Karanth et al., 1999). These structures confer a wide range of properties, including the ability to lower surface and interfacial tension of liquids and to form micelles and micro emulsions between two different phases (Smyth et al., 2010). 3. Biosurfactants are mainly grouped on the basis of the molecular weight, physical and chemical properties and also on the mode of action. On the other hand, the basis of classification of synthetic surfactants is quite different from that of its microbial counterparts. The classification of synthetic surfactants is according to the ionic charge borne by the polar part of the molecules which can be anionic, cationic, non ionic or zwitterionic (Christofi and Ivshina, 2002). Whereas, microbial surfactants are classified mainly on the basis of their chemical composition and the nature of the microorganisms, they originate from. Biosurfactants are also classified as low weight and high weight molecules. Examples of low weight biosurfactants are glycolipids and lipopeptides. The major subtypes of glycolipids are: rhamnolipids, sophorolipids, trehalose lipids, lipopeptides or peptidyl lipids etc. High molecular weight biosurfactants are comprised of polysaccharides, protein, lipopolysaccharides or complex mixtures of these biopolymers . Biosurfactants with high molecular weights are associated with stable emulsions but are not really good at reducing the surface tension of the liquids (Ron and Rosenberg, 2001). On the other hand, low molecular weight microbial surfactants such as glycolipids and lipopeptides can lower the surface and interfacial tension in liquids, but these may not usually form emulsions that are stable (Christofi and Ivshina, 2002). Rhamnolipids is the most common type classified under glycolipids. The major components of rhamnolipids are rhamnose sugar combined with beta-hydroxy fatty acids. The carboxyl end of the beta hydroxyl-fatty acid chain is connected to the rhamnose sugar (Figure 3). Lipopeptides-based biosurfactant class is considered to be particular interest because of the high surface activity and have antibiotic potential. Lipopeptides have been reported to act as antibiotic, antiviral and antitumour agents, immunomodulators or specific toxins and enzyme inhibitors. Ahimou et al. (2000) have reported that with different strains, bacterial hydrophobicity and lipopeptide profile varies to a large extent. Also iturin A has been reported as the only lipopeptide type produced by all Bacillus subtilis strains. The cyclic lipopetides such as decapeptide antibiotic (gramicidins) and lipopeptide antibiotics (polymyxins) are reported to be produced by B .brevis and B. polymyxa, respectively. Arima et al. 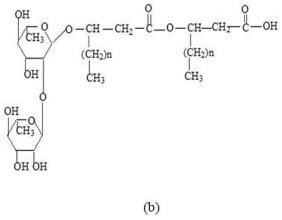 (1968) have reported the cyclic lipopeptidesurfactin produced by B. subtilis ATCC 21332, as one of the most powerful microbial surfactants. 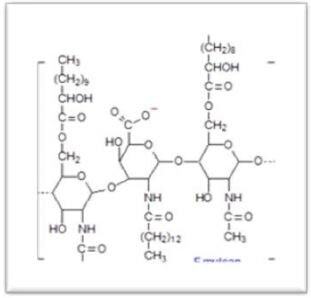 This lipopeptide, even at low concentration as 0.005%, has been reported to have reduced the surface tension of water from 72.0mN/m to 27.9mN/m. Another type of lipopeptides is produced by Bacillus licheniformis. These lipopeptides have stability at high temperature or salt concentrations (Yakimov et al., 1995). A large number of bacteria and yeast species produce good quantities of fatty acid and phospholipid surfactants during growth on n-alkanes (Cirigliano and Carman, 1985; Robert , 1989). Phospholipids are fat derivatives in which one fatty acid has been replaced by a phosphate group and one of several nitrogen containing molecules. It is a major component of cell membranes because these can form lipid bilayers. Beeba and Umbreit (1971) reported the production of phospholipids by Thiobacillus thiooxidans. A variety of microorganisms have been used for bioconversion of different waste materials into biosurfactants. A few are enlisted in Table 1. The selection of appropriate raw material can play a crucial role in making the biosurfactant production, economically and commercially, a viable process. Earlier, biosurfactants were not much accepted on commercial scale because of the high cost of the raw material used. Also the downstream processes involved with biosurfactant production are very costly as compared to that of the synthetically produced surfactants. Lately, a lot research is being done on replacing the expensive raw materials with the cheap or cost free materials that are easily available. It has two positive effects: one being the cost of raw material; and second is that by utilizing these waste materials for the valuable product production, it is indirectly solving the environmental pollution issue. Many of the researches have been done on finding a variety of waste materials that can be utilized for producing biosurfactants. Some of them are listed in Table 2. Fermentation: A Common Technique Used for Production of Biosurfactants. Fermentation may be defined as a set of chemical reactions that cause the degradation of complex organic molecules into simpler compounds. This bioconversion of complex compounds into simpler ones may be induced by living organisms like bacteria, fungi etc Apart from major products like ethanol, carbon dioxide etc, additional compounds or by products are also produced during the fermentation process. These by products are also referred to as secondary metabolites. These secondary metabolites are bioactive compounds such as antibiotics, enzymes, growth factors, peptides biosurfactants etc. (Subramaniyam and Vimala, 2012). Fermentation process can be divided into two major types: submerged or liquid state fermentation and surface or solid state fermentation. Liquid state fermentation is the type of fermentation in which microorganisms are able to grow in the medium present in form of a solution. This type of fermentation process is known for utilizing the substrates present in free flowing liquid, e.g. broth etc. During this process, the secondary metabolites or bioactive compounds such as biosurfactants, antibiotics, peptides etc are secreted into the fermentation broth. Submerged or liquid state fermentation is predominantly used on industrial scale. It is best suited for the microoganims such as bacteria and some fungal strains which require moisture for the optimum growth and production of secondary metabolites. The major advantage of submerged fermentation is that the purification of the bioactive compounds produced during the process is much easier as compared to the surface fermentation (Subramaniyam and Vimala, 2012). On the other hand, the purification of biosurfactants produced on solid state fermentation is difficult and more complicated. During the extraction of product after fermentation, some of the other water soluble compounds apart from desired product may leach out, which makes the purification process quite difficult (Pandey, 2008). Not much research has been done on comparative study of the two techniques for the production of bioactive compounds. Tabaraie et al. (2012) compared use of both the techniques, i.e. solid state fermenation and liquid state for the production of a bioactive compound (cephalosporin-C). It was reported according to this study that solid state fermentation was better than liquid state fermentation for the production of antibiotic compounds by filamentoeus fungi. This conclusion was based on better control of the operating conditions and low cost involved during this process. However, other comparative studies show that for certain strains submerged fermentation is better and vice versa. Thus, implying that the fermentation technique should be chosen based on the microorganism used for production (Subramaniyam and Vimala, 2012). The Du-Nouy-Ring assay is widely applied for screening of biosurfactant producing microbes. The Du-Nouy-Ring method is based on measuring the force required to detach a ring or loop of wire from an interface or surface of the liquid (Tadros, 2005). The detachment force is proportional to the interfacial tension. The advantage of this method is the accuracy and the ease of use. The drop collapse assay was originally developed by Jain, et al. (1991). The drop collapse assay is quite simple and requires no specialized equipment and just a small volume of sample. This assay relies on the destabilization of liquid caused by the presence of surfactants. Therefore, drops of a cell suspension or of culture supernatant are placed on an oil coated, solid surface. If the liquid does not contain surfactants, the polar water molecules are repelled from the hydrophobic surface and the drops remain stable. If the liquid contains surfactants, the drops spread or even collapse because the force or interfacial tension between the liquid drop and the hydrophobic surface is reduced. The stability of drops is dependent on surfactant concentration and correlates with surface and interfacial tension. The oil spreading assay was developed by Morikawa, et al. (2000). For this assay, 10 μl of crude oil is added to the surface of 40 ml of distilled water in a petri dish to form a thin oil layer. Then, 10 μl of culture or culture supernatant are gently placed on the centre of the oil layer. If biosurfactant is present in the supernatant, the oil is displaced and a clearing zone is formed. The diameter of this clearing zone on the oil surface correlates to surfactant activity, also called oil displacement activity. The emulsifying capacity is evaluated by an emulsification index (E24). The Standard method for determining E24 of the culture is by adding 2 ml of kerosene and 2 ml of the cell- free broth in test tube, followed by vortexing for 2 min. The mixture is allowed to stand for 24h. The E24 index can be defined as the percentage of the height of emulsified layer (cm) divided by the total height of the liquid column (cm) (Tabatabaee et al., 2005).The emulsification index (E24) can be calculated by using the following equation (Cooper and Goldenberg, 1987; Sarubbo et al., 2006; Wei et al., 2005) . The bacterial supernatant is mixed with 1% xylene cyanol and drops of the mixture are added onto the surface of parafilm M, which is hydrophobic in nature. The shape of the drop is checked after 1 min. This is followed by evaluating the diameters of the drops. The spread out drops signify the presence of surfactants (Morita et al., 2007). Biosurfactants have a characteristic property of causing lysis of erythrocytes. This methodology of investigating the presence of biosurfactant in a culture was first developed by Mulligan et al. (1984). The methodology used is quite simple. Different microbialcultures are inoculated on blood agar plates (usually sheep blood) and incubated for 2 days at 25°C. The strains capable of producing biosurfactants will exhibit a colorless, transparent ring around the colonies due to the lytic action of biosurfactants on the erythrocytes (Walter et al., 2000). Bacterial Adhesion to Hydrocarbons Assay was developed and proposed by Rosenberg et al. (1980). It is a simple method for determining the surface hydrophobicity characteristic of bacterial cells. The characterization of the biosurfactants is usually done on the purified product obtained after extraction and purification. Characterization helps in analyzing the characteristics of the biosurfactant produced. This can be useful for figuring out their application. For example, as reported by Lin et al. (2011), by characterizing the novel biosurfactant produced in their study, they could suggest its application in skin care products. A few of the characterization techniques used for analyzing biosurfactant properties are listed in Table 3. Biosurfactants are gaining a lot of pace with regard to their usage on the commercial scale. Not only have they found application in industries like laundry, bioremediation, oil recovery but are also used for therapeutic purposes. New trends in their applications have shown their usage for combating effect of green-house gases. Given below are some of the applications of biosurfactants. The term bioremediation refers to the phenomenon in which the metabolic activities ofmicroorganisms are used to remove pollutants. Bioremediation, apart from occurring naturally, can be activated by the addition of certain bioactive compounds produced by various microorganisms. Bioremediators are the microorganisms that can be used for bioremediation. Bioremediation can be mainly classified into two: in situ or ex situ. During in situ bioremediation, the contaminated material is treated at the site itself, while in ex situ procedure the removal of the contaminated material is done elsewhere and not the site of collection itself. The in situ bioremediation thus reduces the risk exposure to cleanup personnel and potentially wider exposure as a result of transportation accidents (Gabriel, 1991). Furthermore, this process has minimal impact on environment as almost no waste products are accumulated because of the complete degradation of the contaminants by microbes capable of producing bioactive compounds e.g. biosurfactants. These characteristics make bioremediation techniques potentially ideal for detoxification of chemical pollutants. Microbes that produce the biosurfactants and other bioactive compounds which are able to degrade the contaminants, are found to be more in numbers when the contaminant is present. However, when the contaminant is degraded the microorganism population declines. After the treatment, the residues left behind are usually harmless byproducts like carbon dioxide, water, and cell biomass (Kumar et al., 2011). Biosurfactants are of much interest in petroleum-related industries because of their role in Enhanced Oil Recovery (EOR). If the primary methods like pumping are used for recovering oil from reservoirs, the recovery is only 30%. However, the addition of biosurfactants lowers the surface as well as interfacial tensions of the oil which helps in facilitating the flow of oil and thus makes the recovery operations easier (Kosaric, 1992). This method is also referred to as Microbial Enhanced Oil Recovery (MEOR). Beckman (1926) was the first person to suggest the usage of microorganism for releasing oil from porous media (Sen, 2008). However it was ZoBell (1947), whose work marked the beginning of a new era of research in petroleum microbiology, mainly focussing on its application for oil recovery (Rashedi et al., 2012). This work was followed by many scientists later on. The study carried out by Updegraff and Wren (1954) was based on the use of underground injected microorganisms. His study showed that these microbes could convert cheap substrates, e.g. molasses into many oil recovery agents including biosurfactants. This study was patented in 1957 (Lazar et al., 2007). Biosurfactants used could reduce the interfacial tension between oil and rock or water surface which resulted in emulsification and in turn improved pore scale displacement and altered the wettability, thus, making recovery process more efficient. As per a statistical evaluation held in U.S in 1995, 81% of all MEOR projects showed a positive increase in oil production with no adverse results or any decrease in oil production. This process is economically feasible as the process needs only minor modifications of the already existing facilities. The installation of the process is less expensive and easy to apply. Petroleum is one of the principal sources of energy on global scale. This source of energy is usually transferred via pipelines or transported on ships through oceans and seas to different parts of the world. The leakage of petroleum, during the transfer, into oceans happens very often. It is therefore one of the major environmental pollutants. Also the large amount of oil sludge and waste oily materials generated by the oil refineries pose a threat to our ecosystem. The expensive disposal methods are the main cause of this threat. The latest example of this type of environmental disaster is Rena oil spill disaster. The fuel on board the Rena consisted of 1,700 tonnes of heavy fuel oil and 200 tonnes of diesel fuel (Taylor, 2011). This oil spill caused a huge loss of flora and fauna. In many such incidents, the recovery is done by chemical technology. However, that also imposes threat to the flora and fauna to some extent. The natural surfactants can find the utility in oil remediation and oil spill clean-up. The biosurfactants can be used for oil spills cleanup or enhanced oil recovery because they can reduce the oil-water interfacial tension leading to emulsification. 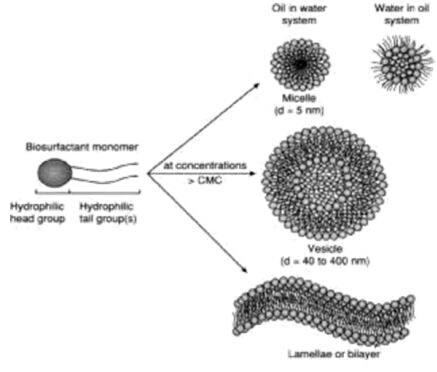 The stability of emulsions formed, is because of the ability of biosurfactantsto lower interfacial tension between interfaces and oil (Banat, 2000). The process of cleaning up of th pipelines, is very expensive and tedious. The conventional pumps fail to remove the sludge and waste oil deposits which results in the accumulation of these by-products in the storage tanks. Manual labour is expensive and time consuming and also very hazardous. Use of biosurfactants is one of the economically viable alternatives. Not only does it help in sludge removal but it also beneficent because of its ability to recover oil from these wastes (Banat et al., 1991). Also recently oil tank bottom sludge was treated with a novel biosurfactant, JE1058BS, produced by an actinomycete Gordonia sp., and it could efficiently clean up the tanks. The dispersion activity by JE1058BS was reported to better than that of chemical counterpart or surfactant having plant origin (Matsui et al., 2012). 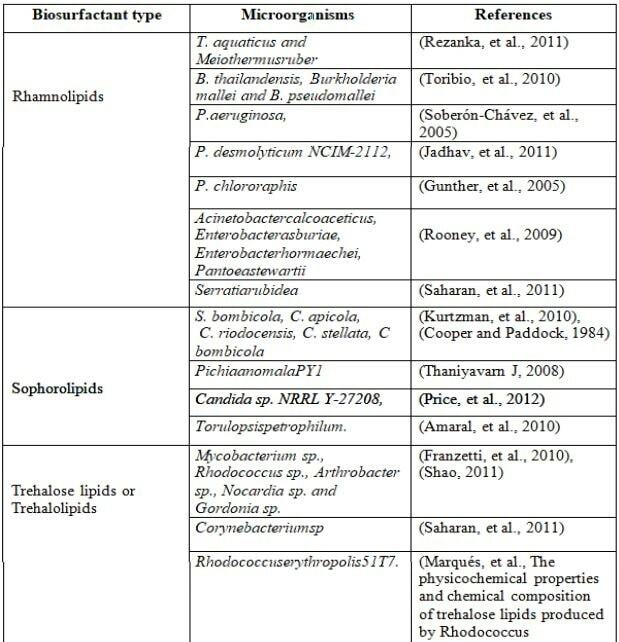 The antimicrobial activity of microbial surfactants has been reported in many literatures in the past decade with its wide range applications (Cameotra and Makkar, 2004). Rodrigues, et al. (2004) reported the anti-bacterial activity of two microbial surfactants probiotic bacteria, Lactococcuslactis 53 and Streptococcus thermophiles A. Both biosurfactants were reported to have high antimicrobial activity against Candida tropicalis GB 9/9, a type of strain held responsible for prostheses failure, even at low concentrations. Abalos et al. (2001), reported that seven different types of rhamnolipid, produced from cultures of Pseudomonas aeruginosa AT10 with soybean oil refinery waste as major substrate, showed excellent antifungal activity against various fungi when tested. Rodrigues et al. (2006) reported the antimicrobial activity of the rhamnolipids that were produced by P. aeruginosa; lipopeptides that were produced by B.subtilis and B. licheniformi sp., and the antimicrobial activity of mannosylerythritol lipids produced by Candida antartica. Kitamoto et al. (2002) also reported, in another study, the antimicrobial activity exhibited by mannosylerythritol lipid (MEL) especially against Gram-positive bacteria (Rodrigues and Teixeira, 2010). The antibacterial activity of lichenysin A, a microbial surfactant produced by B. licheniformis, was reported by Yakimov et al. (1995). Lichenysin A is considered to have the anti-microbial activity almost similar to that of surfactants of chemical origin. Biosurfactants have been found effective in combating colonization by pathogenic microorganisms on the solid surfaces like surgical instruments. Fracchia et al. (2010) showed a biosurfactant (CV8LAC) had a considerable anti-adhesive activity against two biofilm producing strains of C. albicans. Hence, the anti-adhesive properties of the CV8LAC biosurfactant against two Candida albicans biofilm producers suggest that it can be efficiently used as an anti-adhesive product on medical devices (catheters, prosthesis, etc.) to prevent the infections caused by Candida albicans. Another biosurfactant, Pseudofactin II, produced by Pseudomonas fluorescens BD5 is reported to have reduced the adhesion of five bacterial strains (E. coli, Enterococcus faecalis, Enterococcus hirae, Staphylococcus epidermidis and Proteus mirabilis ) and two Candidaalbicans strains, on three different type of surfaces i.e. silicone, glass and polystyrene. In this study, 0.5 mg/ml coating of pseudofactinII, was applied on the polystyrene surface, and the results showed bacterial adhesion reduced by 36-90% and the adhesion of C. albicans was reduced by 92-99% (Janek et al., 2012). Pseudofactin II is also showed inhibitory action against the adhesion of E. faecalis, E. coli, E. hirae and C albicans strains on silicone urethral catheters. Greenhouse effect is a natural process that is responsible for heating the earth`s surface. The gases present in the atmosphere, e.g. CO2, methane etc. have the ability to absorb infra-red radiations emitted from the surface of the earth. Certain studies have reported the utility of microbial surfactants for reduction of CO2 emission into the atmosphere. The biosurfactants may not help in total elimination but may play a significant role in reducing the amount of this green- house gas (GHG) present in the atmosphere (Gakpe et al., 2008). Patel (2003) concluded, based on his study, that the increased production and use of biological surfactants should be part of an overall GHG (Green-house gas) emission reduction strategy consisting of a whole range of measures addressing both energy demand and supply. 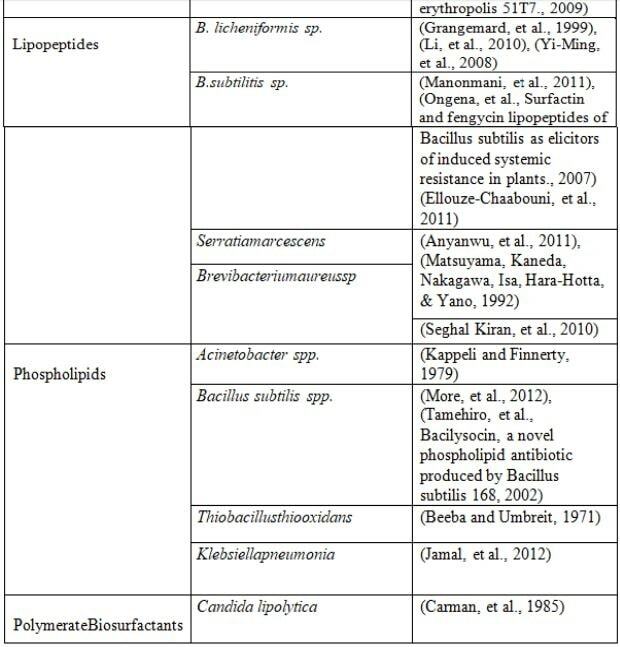 A large number of studies have described antifungal activity of biosurfactants especially, rhamnolipids against a wide variety of phytopathogens e.g. Rhizoctonia sp., Pythium sp. Botrytis sp., Phytophtora sp. and Plasmoparasp etc. Rhamnolipids have two modes of action: antimicrobial activity and are also responsible for stimulating the defense mechanism of plants. This dual property is quite essential for the efficiency of biopesticides. Vatsa et al. (2010), reported the role of rhamnolipids; produced by Pseudomonas spp., in rapid killing of zoospores by rupturing the plasma membrane of three respective zoosporic plant pathogenic microorganisms:Pythiumaphanidernatum, Plasmoparalactucae-radicis, and Phytophthoracapsici. The late blight disease of potatoes is generally caused by Phytophthorainfestans (Mont.) De Bary. Hultberg et al. (2010) investigated the possible role of the biosurfactant-producing strain Pseudomonas koreensis 2.74 in reducing potato late blight disease. This is method is known as biocontrol. The biosurfactant activity for this study was observed in greenhouse trials using a detached-leaf method. Significant reduction in the appearance of disease was reported with this biosurfactant-producing strain. Another aspect of utilizing biosurfactants is using them as adjuvants with pesticides. The biosurfactants find a role in this area because of the pesticide water solubility issues. The surfaces of most of the plant infecting agents such as insects, fungi etc are waxy. On the other hand, most of the pesticides are water based solutions. This makes it difficult for these solutions to penetrate into their target. Biosurfactants, however, are amphiphilic in nature, i.e. they possess a hydrophilic head and hydrophobic tail. These components of the surfactants, in general, help in the reduction of surface tension of the solution and this in turn helps in even dispersion of the pesticides on the surfaces of the target (Thomas et al., 2013). However, the use of natural surfactants on a greenhouse crop is a critical decision. Thomas et al. (2013) reported that some materials such as coconut oils, palm oils, castor oils, lanolins, wheat amino acids, and many others have been used earlier, but not much research is available to verify them as potential adjuvants for improved activity of pesticides. He also states, that there is evidence that can prove these products may serve as sources of food for fungi, bacteria etc. and help their growth. Bergstrand (2010) however, has reported the use of biosurfactants for the sustainibility of green house horticulture. Bergstrand has suggested the use of biosurfactants to control root disease caused by different types of pests and to reduce the need for chemical pesticides. This has been referred to as biocontrol using resident microflora. Bergstrand (2010) has reported, in his study, the potential of the resident microflora for production of bio-control agents in hydroponic systems. This in turn will reduce the need of using chemical pesticides as well as usage of costly disinfection devices. An excessive use of surfactants that have synthetic origin can cause the technogenic or an anthropogenic load on the natural environment of flora and fauna which in turn has a major effect on quality of food products. The use biosurfactants in the food products can help in overcoming this problem, and being effective and ecologically safe. In food industry biosurfactants have found the application mainly due to emulsifying properties Emulsification plays an essential role in phase dispersion and thus helps in the formation of even texture of the product. The characteristics of a certain food product can be influenced by the addition of biosurfactants. Shepherd et al. (1995), reported the crude bioemulsifier obtained from Candida utilis , which exhibited low viscosity and possessed a carbohydrate content of over 80%, had a potential for its use in salad cream or salad dressing. Biosurfactant is one of the ingredients in bakery and ice cream industry. It helps in maintaining the consistency of the product. It also plays role in solubilising flavour oils and helps in retarding the staling of the food items. Biosurfactants are known for its use in food industry during packaging of the products. The presence of biofilms in the packaged food can cause fouling which may be responsible for its contamination, spoilage and eventually disease transmission through ingestion of this food (Hood and Zottola, 1995). Biosurfactants have been investigated for curbing this problem. Busscher et al. (1996) reported that the biosurfactant produced by thermophilic dairy Streptococcus sp. has the potential to be used in controlling fouling as it has the ability to retard the growth or colonization of S. thermophilus which is responsible for fouling. Microbial surfactants are applicablein the cosmetic i n d u s t r y because of their skin compatibility and moisturizing properties (Brown, 1991). The cosmetic industry can utilize a wide range of applications of biosurfactants which include emulsification and de-emulsification, foaming, wetting properties, water binding capacity etc (Gharaei-Fathabad, 2011). Biosurfactants can replace surfactants in almost all of the cosmetic products e.g. bath products, solutions used for contact lenses, hair care and colour products, antiperspirants, nail polishes, massage creams, lipsticks and glosses and other lip make up products, eye makeup products like eye shades and mascaras etc., baby care products, shampoos and conditioners, shaving creams etc. (Schramm et al., 2003). Yamane (1987) has reported that the sophorolipid mixed with propylene glycol in the ratio of 1:12 is specifically compatible with most of the skin types and has thus found commercial utility as a skin moisturizer. Also, Gupta et al. (2012) reported the sophorolipids as potent bactericidal agents and their utility in the treatment of dandruff, body odor or acne etc. Over the past decade, the growth of the global market of biosurfactants market has been enormous. The major reason for this growth is the demand for such products because of their environment-friendly nature, even though the cost of production is still higher as compared to the synthetic surfactants. Consumers are becoming more aware of the hazards caused by thesynthetic agents and this awareness is paving a way for the increased demand of microbial surfactants. It has been reported in Transparency Market Research, among all the geographical regions, the leading country in terms of production and consumption of biosurfactants is Europe followed by North America. It is also reported that detergents and personal care products will be contributing to more than 56.8% of the global biosurfactants market in 2018. In terms of quantity, it is expected that the volume of global biosurfactants market will be 476,512.2 tons by 2018 and 21% of this volume will be consumed by developing countries of Asia etc. Even the companies who were selling surfactant based products have also turned to use of microbial surfactants. Some of them are BASF-Cognis and Ecover. However, BASF-Cognis was ahead with over 20% share of the market in 2011 (Albany, 2012). Basically, the market for biosurfactants is of two types: Highly expensive (value added) and less expensive (commodity) biosurfactants. Highly expensive biosurfactants generally, are applicable for medical use. Many medical applications of biosurfactants have already been enlisted in the applications section in this paper. Most of the biosurfactant produced currently, find their application in value added products like pharmaceuticals or personal care products which are produced in small volumes. It is because the cost of these finished products is usually high as compared to the cost of carbon sources used for feeding the microorganisms. However, use of biosurfactants as commodity surfactants is still questionable. It is because the production cost is sufficiently higher than the selling price of general commodities (Garcia-Becerra et al., 2010). This problem can be alleviated by researching and more and more usage of cost free waste products as major carbon sources for the production of microbial surfactants. 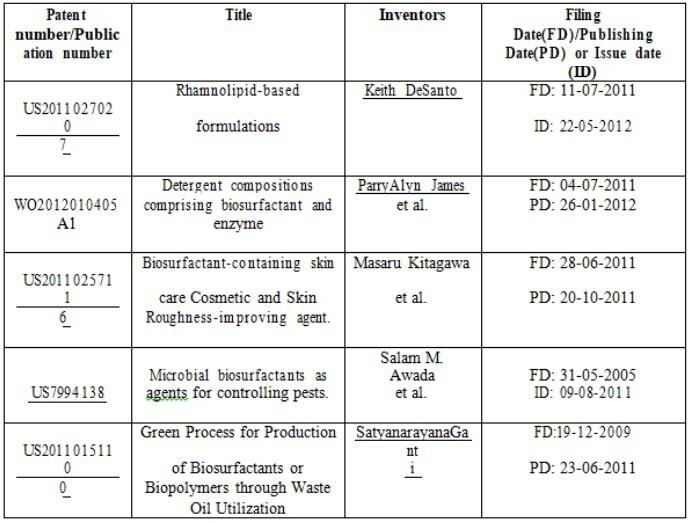 List of a few patents that have been filed in recent times for innovative studies on biosurfactants is given in Table 4. This review provides the generalized information that is essentially required for harnessing the natural resources and a variety of microorganisms for the production of microbial surfactants. Biosurfactants production on industrial scale is still a challenge because of the high costs incurred during the production and purification processes. In order to make the production process economically viable, low cost or cost free raw materials can be used as carbon substrates. A variety of microorganisms such as bacteria, fungi, yeast etc. have been reported to produce biosurfactants by utilizing the low cost waste materials as carbon sources. This paper has enlisted a wide range of raw materials and the microbes used for the production of biosurfactants. Novel microorganisms that can utilize the cheap raw materials and produce microbial surfactants at high yields can bring the breakthrough in the production process. A number of characterization techniques can be applied to determine the type of biosurfactant being produced. An extensive list of characterization techniques used to identify different types of biosurfactants has also been presented in this paper. Biosurfactants have found applications in many different interdisciplinary fields replacing the synthetic surfactants mainly due to their lower toxicity and ability to work under more restrictive environmental conditions. The current and the future trends on biosurfactants suggest that with the economic development in the large scale fermentation production processes and efficient down-stream processing, biosurfactant will soon be commercially successful biotechnological product. Abalos, A., Pinazo, A., Infante, M. R., Casals, M., García, F., & Manresa, A. (2001). Physicochemical and antimicrobial properties of new rhamnolipids produced by Pseudomonas aeruginosa AT10 from soyabean oil refinery wastes. In Langmuir , 17, (5), 1367–1371). ACS publications. Abdel-Mawgoud, A. M., Aboulwafa, M. M., & Hassouna, N. A.-H. (2009). Characterization of Rhamnolipid Produced by Pseudomonas aeruginosa Isolate Bs20. Applied Biochemistry and Biotechnology, 157, 329–345. Adou, M., Tetchi, F. A., Gbane, M., Kouassi, K. N., & Amani, N. G. (2012). Physico- chemical characterization of cashew apple juice (Anacardium occidentale, L.) from 625Yamoussoukro(Cote D'iviire). Innovative Romanian Food Biotechnology, 11, 32-43. Ahimou, F., Jacques, P., & Deleu, M. (2001). Surfactin and iturin A effects on Bacillus subtilis surface hydrophobicity. Enzyme and Microbial Technology,27, 749–54. Amaral, P. F., Coelho, M. A., Marrucho, I. M., & Coutinho, J. A. (2010). Biosurfactants from Yeasts:Characteristics, Production and Application. Advances in Experimental Medicine Biology, 672, 236-49. Anyanwu, C. U., Obi, S. K., & Okolo, B. N. (2011). Lipopeptide Biosurfactant Production by Serratia marcescens NSK-1 Strain Isolated from Petroleum-contaminated Soil. Journal of Applied Sciences Research, 7, (1), 79-87. Arima, K. K. (1968). Surfactin, a crystalline peptide lipid surfactant produced by bacillus subtilis: isolation, characteisation and its inhibition of fibrin clot formation. Biochemical and Biophysical Communications, 31, 488-498. Ashish, Gupta, N., & Debnath, M. (2011). Characterization of Biosurfactant production by mutant strain of Candida tropicalis. 2011 2nd International Conference on Environmental Science and Technology (p. IPCBEE vol.6 (2011)). Sinagapore: 644 (2011) IACSIT Press, Singapore. Banat, I. M. (2000). Potentials for use of biosurfactants in oil spills cleanup and oil bioremediation. Water Studies, (pp. 177-185.). Banat, I. M., Samarah, N., Murad, M., Horne, R., & Banerjee, S. (1991). Biosurfactant production and use in oil tank cleanup. World Journal of Microbiology and Biotechnology, 7, (1), 80-88. Beeba, J. L., & Umbreit, W. W. (1971). Extracellular lipid of Thiobacillus thiooxidans. Journal of Bacteriology, 108, 612-615. Benincasa, M. (2002). Rhamnolipid production by P. aeruginosa LB1 growing on soapstocks the sole carbon source. Journal of Food Engineering, 54, 283-288. Benincasa, M. (2007). Rhamnolipid Produced from Agroindustrial Wastes Enhances Hydrocarbon Biodegradation in Contaminated Soil. Current Microbiology, 54, (6), 445-9. Bergstrand, K.-J. (2010). Approaches for mitigating the environmental impact of greenhouse horticulture. Alnarp: SLU University Library. Bodour, A. A., Guerrero-Barajas, C., Jiorle, B. V., Malcomson, M. E., Paull, A. K., Somogyi, A., Maier, R. M. (2004). Structure and Characterization of Flavolipids, a Novel Class of Biosurfactants Produced by Flavobacterium sp. Strain MTN11. Applied and Environmental Microbiology., 70, (1), 114–120. Brown, M. J. (1991). Biosurfactants for cosmetic applications. International Journal of Cosmetic Science., 13, (2), 61-4. Burgos-Díaz, C., Pons, R., Espuny, M. J., Aranda, F. J., Teruel, J. A., Manresa, A., . . . Marqués, A. M. (2011). Isolation and partial characterization of a biosurfactant mixture produced by Sphingobacterium sp. isolated from soil. Journal of Colloid and Interface Science., 361, (1), 195-204. Busscher, H. J., Kuijl-Booij, M. V., & Me, H. C. (1996). Biosurfactants from thermophilic dairy streptococci and their potential role in the fouling control of heat exchanger plates. Journal of Industrial Microbiology, 16, (1), 15-21. Cameotra, S. S., & Makkar, R. S. (2004). Recent applications of biosurfactants as biological and immunological molecules. Current Opinion in Microbiology., 7, (3), 262-6. Carman, Cirigliano, M. C., & George, M. (1985). Purification and Characterization of Liposan, a Bioemulsifier from Candida lipolytica. Applied and Environmental Microbiology, 50, (4), 846–850. Carrier, A., Parent, J., & Dupuis, S. (2000). Quantitation and characterization of phospholipids in pharmaceutical formulations by liquid chromatography–mass spectrometry. Journal of Chromatography A, 876 , 97–109. Chen, H., Wang, L., Su, C., Gong, G. H., Wang, P., & Yu, Z. L. (2008). Isolation and characterization of lipopeptide antibiotics produced by Bacillus subtilis. Letters in Applied Microbiology., 47, (3), 180-6. Christofi, N., & Ivshina, I. B. (2002). Microbial surfactants and their use in field studies of soil remediation. Journal of Applied Microbiology, 93, 915-929. Cirigliano, M. C., & Carman, G. M. (1985). Purification and characterization of liposan, a bioemulsifier from Candida lipolytica. Applied and Environmental Microbiology., 50, 846-850. Cirigliano, M., & Carman, G. (1984). Isolation of a bioemulsifier from Candida lipolytica. Applied and Environmental Microbiology, 48, 747-750.
Cooper, D. G., & Goldenberg, B. G. (1987). Surface active agents from two Bacillus species. Applied and environmental microbiology., 53, 224-229.
Cooper, D. G., & Paddock, D. A. (1984). Production of a biosurfactant from Torulopsis bombicola. Applied and Environmental Microbiology, 47, 173-176. Das, Chandran, P., & Nilanjana. (2011). Characterization of Sophorolipid biosurfactant produced by yeast species grown on diesel oil. International Journal of Science and Nature, 2, (1), 63-71. Das, K., & Mukherjee, A. K. (2007). Comparison of lipopeptide biosurfactants production by Bacillus subtilis strains in submerged and solid state fermentation systems using a cheap carbon source: Some industrial applications of biosurfactants. Process Biochemistry,.42, (8), 1191–1199. Daverey, A., & Pakshirajan, K. (2009). Production, characterization, and properties of sophorolipids from the yeast Candida bombicola using a low-cost fermentative medium. Applied biochemistry and biotechnology, 158, (3), 663-74. De'ziel, E., Paquette, G., Villemur, R., Le'pine, F., & Bisaillon, J.-G. (1996). Biosurfactant Production by a Soil Pseudomonas Strain Growing on Polycyclic Aromatic Hydrocarbons. Applied and Environmental Microbiology, 62, (6), 1908–1912. Deak, N. A., & Johnson, L. A. (2006). Functional properties of protein ingredients prepared from high-sucrose/low-stachyose soybeans. Journal of American Oil Chemistry society, 83, 811- 818. Desai, J. D., & Banat, I. M. (1997). Microbial production of surfactants and their commercial potential. Microbiology and Molecular Biology Reviews, 61, (1), 47-64. Deshpande, M., & Daniels, L. (1995). Evaluation of sophorolipid biosurfactant production by Candida bombicola using animal fat. Bioresource Technology, 54, 143-150. Dubey, K., & Juwarkar, A. (2001). Distillery and curd whey wastes as viable alternative sources. World Journal of Microbiology & Biotechnology, 17, 61-69. Ellouze-Chaabouni, Ghribi, D., & Semia. (2011). Enhancement of Bacillus subtilis Lipopeptide Biosurfactants Production through Optimization of Medium Composition and Adequate Control of Aeration. Biotechnology Research International, Volume 2011 , Article ID 653654, 6 pages. Fracchia, L., Cavallo, M., Allegrone, G., & Martinotti, M. G. (2010). A Lactobacillus-derived biosurfactant inhibits biofilm formation of human pathogenic Candida albicans biofilm producers. In V. A. Mendez, Current Research, Technology and Education Topics in Applied Microbiology and Microbial Biotechnology,2 , 827-837. Spain: FORMATEX. Franzetti, A., Gandolfi, I., Bestetti, G., Smyth, T. J., & Banat, I. M. (2010). Production and applications of trehalose lipid biosurfactants. European Journal of Lipid Science and Technology, 112, (6), 617 - 627. Gabriel. (1991). Innovative technologies for contaminated site remediation: focus on bioremediation. Journal of Air and Waste Management Association; 41(12), 1657-60. Gakpe, P., Rahman, K. S., & Edward. (2008). Production, Characterisation and Applications of Biosurfactants-Review. Biotechnology, 7, 360-370. Garcia-Becerra, F. Y., Allen, D. G., & Acosta, E. J. (2010). Surfactants from Waste Biomass. In I. J. Mikael Kjellin, Surfactants from renewable sources,167-189. John Wiley & sons Ltd.
Gautam, K. K., & Tyagi, V. K. (2006). Microbial surfactants: A review. Journal of Oleo Science., 55, (4), 155-166. George, S., & Jayachandran, K. (2013). Production and characterization of rhamnolipid biosurfactant from waste frying coconut oil using a novel Pseudomonas aeruginosa D. Journal of Applied Microbiology., 114, (2), 373-83. Gharaei-Fathabad, E. (2011). 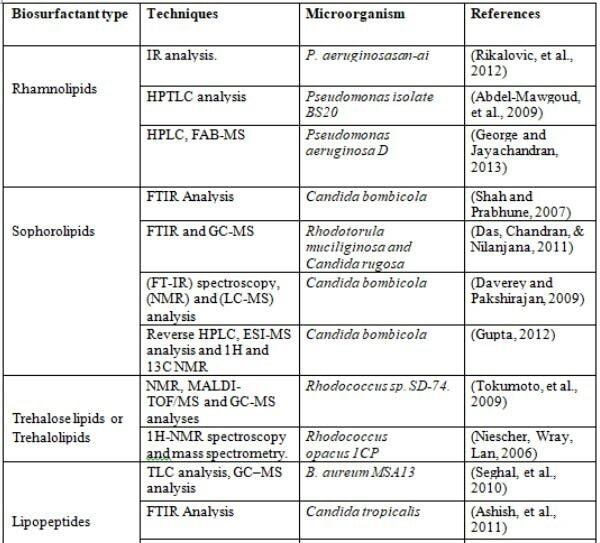 Biosurfactants in Pharmaceutical Industry (A Mini-Review). American Journal of Drug Discovery and Development, 1, (1), 58-69. Grangemard, I., Bonmatin, J., Bernillon, J., Das, B., & Peypoux, F. (1999). Lichenysins G, a novel family of lipopeptide biosurfactants from Bacillus licheniformis IM 1307: production, isolation and structural evaluation by NMR and mass spectrometry. Journal of Antibiotics (Tokyo), 52, (4), 363-73. Gunther IV, N. W., Nuñez, A., Fett, W., & Solaiman, D. K. (2005). Production of Rhamnolipids by Pseudomonas chlororaphis, a Nonpathogenic Bacterium. Applied and Environmental Microbiology, 71, 5 , 2288-2293. Hood, S. K., & Zottola, E. A. (1995). Biofilms in food processing. Food Control, Vol. 6, (1), 9-18. Hultberg, M., Bengtsson, T., & Liljeroth, E. (2010). Late blight on potato is suppressed by the biosurfactant-producing strain Pseudomonas koreensis 2.74 and its biosurfactant. BioControl, 55, (4), 543-550. Jadhav, M., Kalme, S., Tamboli, D., & Govindwar, S. (2011). Rhamnolipid from Pseudomonas desmolyticum NCIM- 2112 and its role in the degradation of Brown 3REL. Journal of Basic Microbiology, 51 ,1-12. Jain, D. K., Collins-Thompson, D. L., Lee, H., & Trevors, J. T. (1991). A drop-collapsing test for screening biosurfactant-producing microorganisms. Journal of Microbiology Methods, 13, (4), 271-279. Jamal, P., Nawawi, W. M., & Alam, M. Z. (2012). Optimum Medium Components for Biosurfactant Production by Klebsiella pneumoniae WMF02 Utilizing Sludge Palm Oil as a Substrate. Australian Journal of Basic and Applied Sciences, 6, (1), 100-108. Jarvis, F. &. (1949). A glycolipid produced by Pseudomonas aeruginosa. Journal of the American Chemical Society,71, 4124- 4126. Kappeli, O., & Finnerty, W. R. (1979). Partition of alkane by an extracellular vesicle derived from hexadecane-grow Acinetobacter. Journal of Bacteriology, 140, 707-712. Karanth, N. G., Deo, P. G., & Veenanadig, N. K. (1999). Microbial production of biosurfactants and their importance. Current Science, 77, 116-126. Khoshdasta, H., Sama, A., Valib, H., & Noghab, K. A. (2011). Effect of rhamnolipid biosurfactants on performance of coal and mineral flotation. International Biodeterioration & Biodegradation, 65, (8), 1238–1243. Kitamoto, D., Yanagishita, H., Shimbo, T., Nakane, T., Kamisawa, C., & Nakahara, T. (1993). Surface active properties and antimicrobial activities of mannosylerythritol lipids as biosurfactants produced by Candida antarctica. Journal of Biotechnology, 29, 91–6. Kosaric, N. (1992). Biosurfactants in industry. Pure & Applied Chernistry, 64, (11), 1731- 1737. Kosaric, N. (2001). Biosurfactants and Their Application. Food Technology and Biotechnology, 39, (4) 295–304. Kretschmer, A., Bock, H., & Wagner, F. (1982). Chemical and Physical Characterization of Interfacial-Active Lipids from Rhodococcus erythropolis grown on N-alkane. Applied and Environmental Microbiology., 44, (4), 864-870. Kumar, A., Bisht, B. S.,Joshi,V. D., &Dhewa, T. (2011). Review on Bioremediation of Polluted Environment: A Management International Journal of Environmental Science, 1, (6), 1079- 1093. Kumari, P. S., & Mani, K. (2012). Economically Viable Wheat Bran Extracts Media for the Mass Production of Biosurfactant from Pseudomonas Aeruginosa. 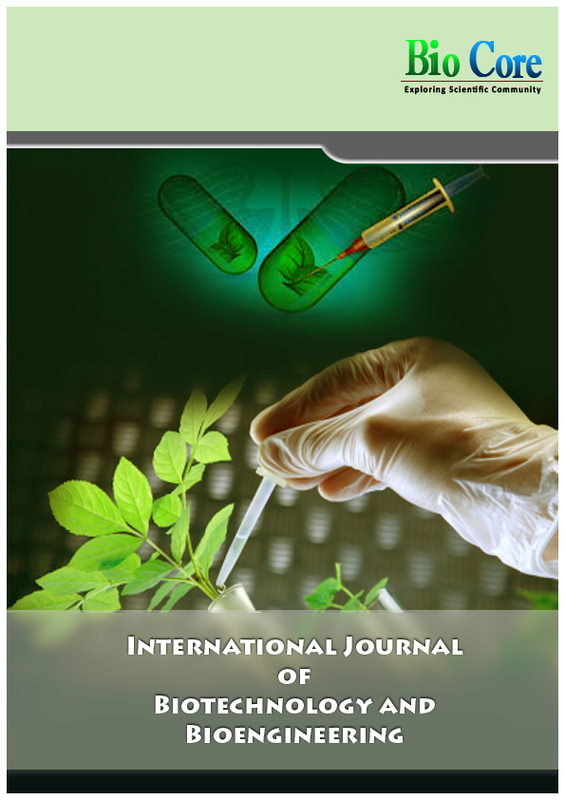 The IUP Journal of Biotechnology, Vol. VI, (1), 18-24. Kurtzman, C.,Price, N., Ray, K., & Kuo, T. (2010). Production of sophorolipid biosurfactants by multiple species of the Starmerella (Candida) bombicola yeast clade. FEMS Microbiology Letters, 311, (2), 140-6. Lazar, Petrisor, G., & Yen, T. F. (2007). 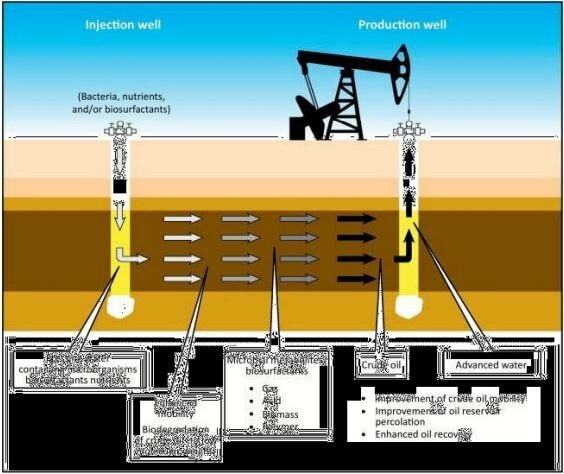 Microbial Enhanced Oil Recovery (MEOR). Petroleum Science and Technology, 25, 1353–1366. Li, Y., Yang, S., & Mu, B. (2010). Structural characterization of lipopeptide methyl esters produced by Bacillus licheniformis HSN 221. Chemistry and Biodiversity, 7, (8), 2065-75. Lin, T.-C., Chen, C.-Y., Wang, T.-C., & Chen, Y.-S. (2011). Characterization of Biosurfactant from a Diesel-oil Degradation Bacterium and Application Potential in Beauty Care Products. 2011 3rd International Conference on Chemical, Biological and Environmental Engineering (pp. 114-118). Singapore: IPCBEE vol.20 (2011) © (2011)IACSIT Press, Singapore. Maier, R. M. (2003). Biosurfactants: Evolution and Diversity in Bacteria. Advances in Applied Microbiology, 52, 101–121. Makkar, R. S., & Cameotra, S. S. (2002). An update on use of unconventional substrates for biosurfactants production and their new applications. Applied Microbiology and Biotechnology, 58, 428-434. Makkar, R. S., Cameotra, S. S., & Banat, I. (2011). Advances in utilization of renewable substrates for biosurfactant production. AMB Express, 1, 5. Manonmani, A., Geetha, I., & Bhuvaneswari, S. (2011). Enhanced production of mosquitocidal cyclic lipopeptide from Bacillus subtilis subsp. subtilis. Indian Journal of Medical Research., 134, 476-82. Marchant, R., & Banat, I. M. (2012). Microbial biosurfactants: challenges and opportunities for future exploitation. Trends in Biotechnology, 30, (11), 558–565. Marqués, A., Pinazo, A., Farfan, M., Aranda, F., Teruel, J., Ortiz, A., . . . Espuny, M. (2009). The physicochemical properties and chemical composition of trehalose lipids ics of lipids, 158, (2), 110-7. Martins, V. G., Kalil, S. J., Bertolin, T. E., & Costa, J. A. (2006). Solid state biosurfactant production in a fixed-bed column bioreactor. Zeitschrift für Naturforschung C: A Journal of Biosciences, 61, (9-10), 721-6. Matsui, T., Namihira, T., Mitsuta, T., & Saeki, H. (2012). Removal of Oil Tank Bottom Sludge by Novel Biosurfactant, JE1058BS. Journal of the Japan Petroleum Institute, 55, (2), 138- 141. Matsuyama, T., Kaneda, K., Nakagawa, Y., Isa, K., Hara-Hotta, H., & Yano, I. (1992). A novel extracellular cyclic lipopeptide which promotes flagellum-dependent and - independent spreading growth of Serratia marcescens. Journal of Bacteriology, 174, (6), 1769-76. Mercadé, M. E., Manresa, M. A., Robert, M., Espuny, M. J., Andrés, C. d., & Guinea, J. (1993). Olive oil mill effluent (OOME). New substrate for biosurfactant production. Bioresource Technology, 43, (1), 1–6. More, S. M., Shinde, V. A., Saiqua, K., Girde, A. V., & Pawar, V. N. (2012). Antimicrobial Activity of Phospholipid Compound Produced by Acidophilic Bacillus subtilis Isolated from Lonar Lake, Buldhana, India. Research Journal of Recent Sciences, 1, (11), 22-26. Morikawa, M., Hirata, Y., & Imanaka, T. (2000). A study on the structure-function relationship of lipopeptide biosurfactants. Biochimica et Biophysica Acta (BBA), 1488, (3), 211–218. Morita, T., Konishi, M., Fukuoka, T., Imura, T., & Kitamoto, D. (2007). Physiological Differences in the Formation of the Glycolipid Biosurfacants, Mannosylerythritol Lipids, between Pseudozyma antartica and Pseudozyma aphidis. Applied Microbiology and Biotechnology, 74, 307-315. Mulligan ., C., Cooper, D., & Neufeld, R. (1984). Selection of Microbes Producing Biosurfactants in Media without Hydrocarbons. Journal of fermentation technology, 62, (4), 311–314. Nawawi, W. M., Jamal, P., & Alam, M. Z. (2010). Utilization of sludge palm oil as a novel substrate for biosurfactant production. Bioresource Technology., 101,23, 9241-7. Niescher, S., Wray, V., Lang, S., Kaschabek, S. R., & Schlömann, M. (2006). Identification and structural characterisation of novel trehalose dinocardiomycolates from n-alkane- grown Rhodococcus opacus 1CP. Applied Microbial and Cell physiology., 70, 605 611. Nitschke, M., & Pastore, G. M. (2003). Cassava flour wastewater as a substrate for biosurfactant production. Applied Biochemistry and Biotechnology, 106, (1-3), 295- 301. Noudeh, G. D., Noodeh, A. D., Moshaf, M. H., Behravan, E., Afzadi, M. A., & Sodagar, M. (2010). Investigation of cellular hydrophobicity and surface activity effects of biosynthesed biosurfactant from broth media of PTCC 1561. African Journal of Microbiology Research, 4, (17), 1814-1822,. Onbasli, A. B. (2009). Biosurfactant production in sugar beet molasses by some Pseudomonas spp. Journal of Environmental Biology, 30, 161-163. Ongena, M., Jourdan, E., Adam, A., Paquot, M., Brans, A., Joris, B., Thonart, P. (2007). Surfactin and fengycin lipopeptides of Bacillus subtilis as elicitors of induced systemic resistance in plants. Environtal Microbiology, 9, (4), 1084-90. Pacwa-Płociniczak, M., Płaza, G. A., Piotrowska-Seget, Z., & Cameotra, S. S. (2011). Environmental Applications of Biosurfactants: Recent Advances. International Journal of Molecular Sciences, (1), 633–654. Patel, M. (2003). Surfactants Based on Renewable Raw Materials. Journal of Industrial Ecology, 7, 47–62. Patel, R. M., & Desai, A. J. (1993). Biosurfactant production by Pseudomonas aeruginosa GS3 from molasses. Letters in Applied Microbiology, 25, 91-94. Pornsunthorntawee, O., Wongpanit, P., & Rujiravanit, R. (2010). 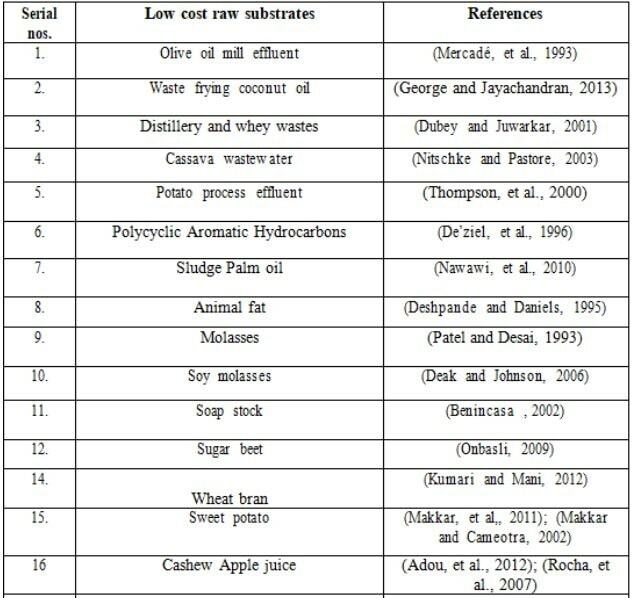 Rhamnolipid factants: production and their potential in environmental biotechnology. Advances in Experimental Medicine and Biology., 672, 211-21. Pradeep, N. V., Anupama, Anitha, G., Renukamma, Avvaru, S., & Afreen, S. S. (2012). Bioremediation of oil contaminated soil using biosurfactant produced by seudomonas aeruginosa. Journal of Research in Biology, 2, (4), 281-286. Price, N. P., Ray, K. J., Vermillion, K. E., Dunlap, C. A., & Kurtzman, C. P. (2012). Structural characterization of novel sophorolipid biosurfactants from a newly identified species of Candida yeast. Carbohydrate Research, 348, 33-41. Rashedi, H., Yazdian, F., & Naghizadeh, S. (2012). Microbial Enhanced Oil Recovery. In L.
Rezanka, T., Siristova, L., & Sigler, K. (2011). Rhamnolipid-producing thermophilic bacteria of species Thermus and Meiothermus. Extremophiles : life under extreme conditions, 15, (6), 697-709. Rikalovic, M. G., Gojgic-cvijovic, G., Vrvic, M. M., & Karadzic, I. (2012). Production and characterization of rhamnolipids from Pseudomonas aeruginosa san-ai. Journal of the Serbian Chemical Society., 77, (1), 27–42. Robert, M., Mercade, M. E., Bosh, M. P., Parra, J. L., Espuny, M. J., Manresa, M. A., & Guinea. (1989). Effect of carbon source on biosurfactant production by Pseudomonas aeruginosa 44T1. Biotechnology Letters, 11, 871-874. Rocha, M., Souza, M., & Benedicto, S. (2007). Production of biosurfactant grown on cashew apple juice. Biochemistry and Biotechnology, 53, 136-140. Rodrigues, L. R., & Teixeira, J. A. (2010). Biomedical and therapeutic applications of biosurfactants. Advances in Experimental Medicine and Biology; 672, 75-87. Rodrigues, L. R., van der Mei, H. C., Teixeira, J., & Oliveira, R. (2004). Influence of biosurfactants from probiotic bacteria on formation of biofilms on voice prostheses. Applied and Environmantal Microbiology, 70, 4408-4410. Rodrigues, L., Teixeira, J., Oliveir, R., & van der Me, H. C. (2006). Response surface optimization of the medium components for the production of biosurfactants by probiotic bacteria. Process Biochemistry , 41 , 1–10. Ron, E. Z., & Rosenberg, E. (2001). Natural role of biosurfactants. Environmental Microbiology, 4, 229-36. Rooney, A. P., Price, N. P., Ray, K. J., & Kuo, T. M. (2009). Isolation and characterization of rhamnolipid-producing bacterial strains from a biodiesel facility. FEMS Microbiology Letters, 295, (1), 82-7. Rosen, M. J., & Kunjappu, J. T. (2012). Characteristic Features of Surfactants. In J. T. Milton J. Rosen, Surfactants and Interfacial Phenomena (p. chapter 1). Hoboken, NJ, USA. : John Wiley & Sons, Inc., . Rosenberg, E., Rubinovitz, C., Legmann, R., & Ron, E. (1988). Purification and chemical- properties of Acinetobactercalcoaceticus A2 biodispersan. Applied and Environmental Microbiology, 54, 323-326. Rosenberg, M., Gutnick, D., & Rosenberg, E. (1980). Adherence of bacteria to hydrocarbons: a simple method for measuring cell-surface hydrophobicity. FEMS Microbiology Letters, 9, 29-33. Saharan, B. S., Sahu, R. K., & Sharma, D. (2011). A Review on Biosurfactants: Fermentation, Current Developments and Perspectives. Genetic Engineering and Biotechnology Journal, 97; 336-341. Saharan, B. S., Sahu, R. K., & Sharma, D. (2012). A Review on Biosurfactants: Fermentation, Current Developments and Perspectives. Genetic Engineering and Biotechnology Journal, Volume 2011: GEBJ-29. Sarubbo, L. (2006). Production and Stability Studies of the Bioemulsifier Obtained from a Strain of Candida glabrata UCP 1002. Journal of Biotechnology., 9, (4), 400-406. Satpute, S. K., Banpurkar, A. G., Dhakephalkar, P. K., Banat, I. M., & Chopade, B. A. (2010). Methods for investigating biosurfactants and bioemulsifiers: a review. Critical Reviews in Biotechnology, 1-18. Schramm, L. L., Stasiuk, E. N., & Marangoni, D. G. (2003). Surfactants and their applications. Annual Reports Section "C" (Physical Chemistry), 99, 3-48. Seghal, K. G., Thomas, T. A., Selvin, J., Sabarathnam, B., & Lipton, A. P. (2010). Optimization and characterization of a new lipopeptide biosurfactant produced by marine Brevibacterium aureum MSA13 in solid state culture. Bioresource Technology, 101 , 2389–2396. Sen, R. (2008). Biotechnology in petroleum recovery: The microbial EOR. Progress in Energy and Combustion Science, 34, (6), 714–724. Shah, S., & Prabhune, A. (2007). Purification by silica gel chromatography using dialysis tubing and characterization of sophorolipids produced from Candida bombicola grown on glucose and arachidonic acid. Biotechnology Letters, 29, (2), 267- 272. Shao, Z. (2011). Trehalolipids. In G. Soberón-Chávez, Biosurfactants (pp. 121-143). Shepherd, R., Rockey, J., Sutherland, I. W., & Roller, S. (1995). Novel bioemulsifiers from microorganisms for use in foods. Journal of Biotechnology., 40, (3), 207-17. Singleton, J. A., Ruan, M., Sanford, J. H., Haney, C. A., & Stikeleather, L. F. (1999). Separation and Characterization of Peanut Phospholipid Molecular Species Using952 High-Performance Liquid Chromatography and Fast Atom Bombardment Mass Spectrometry. Journal of the American Oil Chemists' Society, 76, 49–56. Smyth, T. J., Perfumo, A., Marchant, R., Banat, I. M., Chen, M., Thomas, R. K., . . . Parry, N. J. (2010). Directed microbial biosynthesis of deuterated biosurfactants and potential future application to other bioactive molecules. Applied microbiology and biotechnology, 87, (4), 1347-54. Soberón-Chávez, G., Lépine, F., & Déziel, E. (2005). Production of rhamnolipids by Pseudomonas aeruginosa. Applied Microbiology and Biotechnology, 68, (6), 718-25. Subramaniyam, R., & Vimala, R. (2012). Solid state and submerged fermentation for the production of bioactive substances: A comparative study. International Journal of Science and Nature., 3, (3), 480-486. Tabaraie, B., Ghasemian, E., Tabaraie, T., Parvizi, E., & Rezazarandi, M. (2012). Comparative Evaluation of Cephalosporin-C production in Solid state fermentation and Submerged liquid culture. Journal of Microbiology, Biotechnology and Food Sciences., 2, (1), 83-94. Tabatabaee, Assadi, M. M., Noohi, A. A., & Sajadian, V. (2005). Isolation of Biosurfactant Producing Bacteria from Oil Reservoirs. Tabatabaee, A., Assadi, M.M., Noohi, A.A. and Saja Iranian Journal of Environment Health Science Engineering., 2, (1), 6-12. Tadros, T. F. (2005). Adsorption of surfactants at the air/liquid and liquid/liquid interfaces. In Applied Surfactants: Principles and Applications (pp. 81-82). Wiley-VCH Verlag GmbH & Co., KGaA, Weinheim, FRG. .
Tamehiro, N., Okamoto-Hosoya, Y., Okamoto, S., Ubukata, M., Hamada, M., Naganawa, H., & Ochi, K. (2002). Bacilysocin, a novel phospholipid antibiotic produced by Bacillus Subtilis 168. Antimicrobial Agents and Chemotherapy, 46, (2), 315-20. Taylor, A. (2011, october 14). Oil Spill Disaster on New Zealand. The Atlantic. New Zealand. Thaniyavarn, J., Chianguthai, T., Sangvanich, P., Roongsawang, N., Washio, K., Morikawa, M., & Thaniyavarn, S. (2008). Production of sophorolipid biosurfactant by Pichia anomala. Bioscience Biotechnology and Biochemistry, 72, (8), 2061-2068. Thavasi, R., Jayalakshmi, S., Balasubramanian, T., & Banat, I. M. (2008). Production and characterization of a glycolipid biosurfactant from Bacillus megaterium using economically cheaper sources. World Journal of Microbiology and Biotechnology, 24, (7), 917-925. Thomas, Czarnota, M., & Paul. (2013, January 22). Using Surfactants, Wetting Agents and Adjuvants in the Greenhouse. University of Georgia, College of Agricultural and Environmental Sciences B 1319. Thompson, D. N., Fox, S. L., & Bala, G. A. (2000). Biosurfactants from potato process effluents. Applied Biochemistry and Biotechnology., 84-86, (1-9), 917-30. Tokumoto, Y., Nomura, N., Uchiyama, H., Imura, T., Morita, T., Fukuoka, T., & Kitamoto, D. (2009). Structural characterization and surface-active properties of a succinoyl trehalose lipid produced by Rhodococcus sp. SD-74. Journal of Oleo Science., 58, (2), 97-102. Toribio, J., Escalante, A. E., & Soberón-Chávez, G. (2010). Rhamnolipids: Production in bacteria other than Pseudomonas aeruginosa. European Journal of Lipid Science and Technology, 112, (10), 1082–1087. Updegraff, D. M., & Wren, G. B. (1954). The Release of Oil from Petroleum-Bearing Materials by Sulfate-Reducing Bacteria. Applied Microbiology, 2, (6), 309–322. Vatsa, P., Sanchez, L., Clement, C., Baillieul, F., & Dorey, S. (2010). Rhamnolipid Biosurfactants as New Players in Animal and Plant Defense against Microbes. International Journal of Molecular Sciences, 11, (12), 5095–5108. Vijayaraghavan, P., Remya, C. S., & Vincent, S. G. (2011). Production of α-Amylase by Rhizopus microsporus using Agricultural By-products in Solid State Fermentation. Research Journal of Microbiology, 6, 366-375. Wei, Y. H., Chou, ,. C., & Chang, J. S. (2005). Rhamnolipid production by indigenous Pseudomonas aeroginosa J4 originating from petrochemical waste water. Biochemical Engineering Journal., 24, 146-154. Yakimov, M. M., Timmis, K. N., Wray, V., & Fredrick. (1995). Characterization of a new lipopeptide surfactant produced by thermotolerant and halotolerant subsurface Bacillus Licheniformis BAS 50. Applied Environmental and Biotechnology, 61, 1706- 1713. Yamane, T. (1987). Enzyme technology for the lipid industry: an engineering overview. Journal of the American Oil Chemists' Society, 64 , (12) 1657-1662. Yi-Ming, L., Haddad, N. I., Yang, S.-Z., & Mu, B.-Z. (2008). Variants of Lipopeptides Produced by Bacillus licheniformis HSN221 in Different Medium Components Evaluated by a Rapid Method ESI-MS. International Journal of Peptide Research and Therapeutics, 14, (3), 229-235. Zhang, S.-M., Wang, Y.-X., Meng, L.-Q., Li, J., Zhao, X.-Y., Cao, X., Li, J.-F. (2012). Isolation and characterization of antifungal lipopeptides produced by endophytic Bacillus amyloliquefaciens TF28. African Journal of Microbiology, 6, (8), 1747- 1755. Zhu, Y., Gan, J.-j., Zhang, G.-l., Yao, B., Zhu, W.-j., & Meng, Q. (2007). Reuse of waste frying oil for production of rhamnolipids using Pseudomonas aeruginosa zju.u1M. Journal of Zhejiang University SCIENCE A, 8, (9), 514-1520.